Many Christians insist that Christmas is a Christian religious holiday which belongs exclusively to them. While there are many ways to celebrate Christmas in a Christian manner, the simple fact is that there are many important elements to popular Christmas celebrations which have nothing whatsoever to do with religion or Christianity. These secular elements of Christmas are at least as important as the religious ones. So if you want to celebrate Christmas, you can do so without religion. The most popular symbol of Christmas, except perhaps for Santa Claus, may also be the least Christian: the Christmas tree. 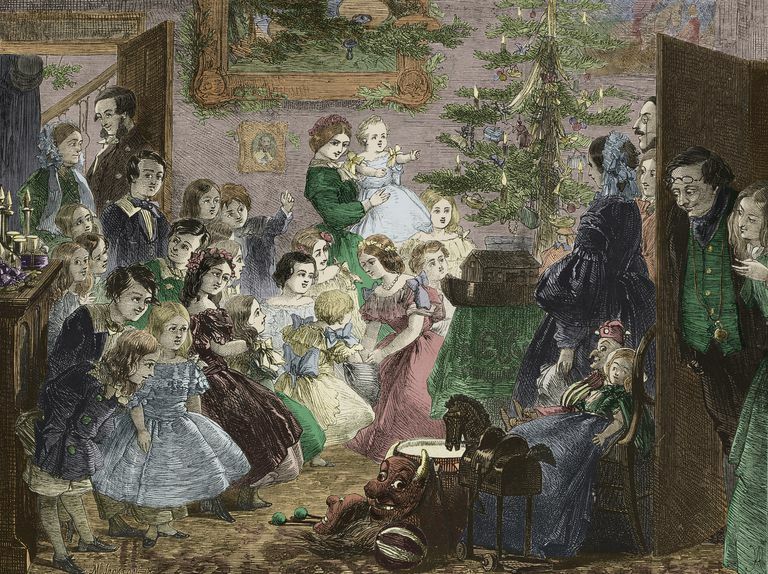 Originally derived from pagan religious celebrations in Europe, the Christmas Tree was adopted by Christianity but never entirely at home in it. Today the Christmas Tree can be a completely secular symbol of Christmas celebrations, especially if you don't add any religious ornaments. Instead, decorate it with colors and ornaments that are important to you personally. If people do anything during the Christmas holidays, they probably end up wrapping and giving gifts. Some may give religious gifts and/or use religious wrapping paper, but there is no need to do so. Most people give secular gifts and use non-religious wrapping. There's nothing especially Christian or religious about exchanging gifts on Christmas. If you want to exchange gifts with others on Christmas, you can do so without any references to religion or Christianity. The one area where religion continues to have influence on otherwise secular celebrations of a secular Christmas is through religious Christmas songs. Many of the most popular and traditional songs of Christmas are religious—such as Silent Night, Holy Night and Oh Come All Ye Faithful. Many other popular song are completely secular, though, such as Dreaming of a White Christmas and Walking in a Winter Wonderland. If you want non-religious songs at Christmas, there are plenty to choose from. The most prominent symbol of Christmas today isn't Jesus, which he should be if Christmas were a Christian religious holiday just for celebrating the birth of Jesus. Instead, it's Santa Claus, who appears to have started out as a Christian saint but today is nothing remotely like that. Instead, he's closer to some non-Christian stories of an elf that brings gifts in exchange for food. No one who includes images of Santa Claus in their Christmas is using an inherently Christian figure. There are lots of special foods that appear during the Christmas season and there is nothing religious about them. The secular nature of Christmas foods is so obvious that some evangelical Christians have been forced to make up religious meanings for them — like pretending that the colors on the candy cane represent aspects of Jesus and Christian theology. The truth is, though, that Christmas foods are secular and have nothing to do with Christian traditions or theology. One of the most popular activities at Christmas is gathering with family for celebrations. Sometimes there are religious elements, like church services — in fact, some people only go to church on this date during the year. There's nothing about family gatherings, though, that forces them to be religious. People do many things with their families over the holidays which are completely secular. Since many have time off at the end of December, it's an excellent chance to renew familial ties. It's popular to talk about the "Christmas Spirit" during the holiday season, a reference to a spirit of good will, altruism, and generosity. Christians might like to take credit for the Christmas spirit, but they shouldn’t. Christmas was traditionally a time when Christians engaged in somber reflection on death, salvation, and Jesus' Second Coming — not a time for charity and generosity. That's largely a development of modern secular culture which Christian charities are benefiting from. The most secular aspect of the Christmas holidays is surely the most prominent one as well: the extensive commercialization that no one can entirely escape. Retailers start encouraging people to buy gifts, decorations, cards, and other associated items starting as early as Halloween and the pressure continues right through the after-Christmas sales. The money made from Christmas is too important to the economy for this to change or even to decrease.